Register Log In GliderCENTRAL Forums Fact or Fiction Archives Do gliders shed? Do their coats change? From another thread, a question was asked about whether or not gliders shed. Gliders DO shed but it is very very minimal and not something you should notice. Not like with a dog or cat. Their hairs are so tiny that what little they do shed, would be really hard to see. 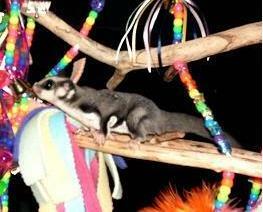 If you are seeing glider hairs, and lots of them, then it is time to really look into their housing environment. Is it to warm? Is the humidity up high enough? What diet are they eating and are they being picky eaters and not getting what they need? What else could you be seeing? Is it time for the vet? Has anyone else ever noticed their gliders shedding, even a little bit? I have brought up the subject of shedding, and possibly a "coat change" in the past and was ...mildly ridiculed....whats your thought on that possibility? Also I have one glider that has hair that is much longer than the other 3. I think that yes, gliders coats can change. It is often caused from changes in environment (temperatures, humidity etc). Most animals will grow thicker coats in colder weather and shed some of it when it starts to warm up again. How often that happens with captive gliders may be very less often because we tend to keep our houses a pretty steady temperature. I've seen it with changes in diet or changes in stress levels (though that would probably have to be long term stress). Reep came to me almost bald (total body) and when we were finally able to remove the stress and get him on a good diet, his hair did grow back but he was a different color than his previous photos showed him to be. Also, Baybe...when I first met Baybe, she was such a GORGEOUS color! I call it a "champagne" color like with some car paints. Not tan but not silver or gold...somewhere in between. Always loved the color. But Bourbon said she was a classic grey but was showing her age. I noticed my older gliders colors have changed as well with age. They get "softer" in color. Their fur density changed some too (Dixie and Dexter's did anyway). As for the longer hair..wow...that must be VERY cool! I think that is just a "thing" some gliders may have like two puppies from the same litter, one may have longer hair than the other. Just another way each glider is unique. These are my opinions and observations of my gliders or ones I've seen. I posted in the other thread as well, but yes, I believe that gliders shed. Their fur is very thin and fine (when Kira was going through a rough spot several years ago, some of her fur was falling out and I got to see and feel how fine and soft it was). In watching Kira and Dakota, who have had trouble with staining, they shed from the head down their back and then their tails. There is actually a line that moves down their back when this happens. Grey above and beige/brown below. Any mammal will shed, people with "hair" shed once the follicle dies so why wouldn't gliders.. Also to say that poodles n what not don't shed, umm what happens with the hair follicle dies? Don't they shed as well. Never got the jist of the non shedding thing lol! The "longer" hair doesnt look noticeably longer until you move it around. Then compare its length to the other gliders in the house. As you may have guessed it is my Arwen. I was always concerned that no matter what I fed her, what the conditions are in the house she always had a "cracked" look to her, especially along the edges of her patagium by her front legs. 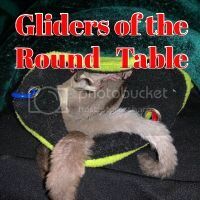 I realized one day while handling the other gliders in the house, who have no crackly looks, that their fur is shorter. Her fur seems to be just as dense as theirs, but the longer length seems to give it a crackle when she moves. I also forgot to mention that during season changes I occasionally have seen small (VERY small) tufts of fur sticking out of their coats that are easily removed when pulled. Much like you see on a dog or horse that is shedding.